My body is screaming to stop the madness of holiday indulgence. While crazy tasty, the concoction of Christmas hor d’oeuvres, massive meals, chocolatinis, cookies and treats has made my system reach it’s processing limit and my derriere hit epic proportions. Like many well-intendeds, it was time to start my resolution to lose the weight I’ve gained since Thanksgiving. I had enough, so I launched into resolve two days ago, December 28, after yet another huge dinner…of Christmas dinner leftovers. After happily skipping off to sleep anticipating a wonderful new day of health, I woke, felt my stomach eating the other side and growling loudly and instantly reached for the homemade Biscotti on the counter to dip into my morning coffee. I had made it three full hours. Yeah. Technically I have until January 2 to begin, right?! 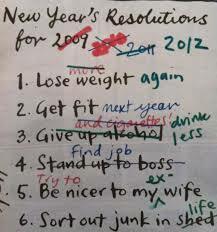 Resolutions are good things. But the wheels inevitably fall off and thus they go bad. Quickly. The typical pattern is the same. We are energized by the fresh start, the new beginning. We cast off feelings of failure and disappointment and pain associated with the year behind us and we’re anxious to make the new year better. We make our list of goals for the new year and may even post them on the refrigerator: get fit, stop drinking, be nice, etc… Week 1, we begin with vigor, week 2 our normal routine kicks in and we struggle against the rut we’ve created but keep trying. Week 3, we’ve failed so often, we give it a few fleeting final attempts, and by week 4, it’s DOA. It’s an accomplishment to have made it that long. The intent was good. Maybe we just need to change the method. Maybe instead of listing goals that often focus on ceasing negative habits, we focus on ONE WORD for the entire year. Maybe we determine a core character trait that we keep in front of us, make choices that lean into that character, and grow the entire year. Maybe if we chose a positive trait, something we work to become, we’d find ourselves actually accomplishing many of the things on our initial lists, but achieve them because we’re gaining the character needed to do so. Champions have common threads of character they pinpoint as essential to achieving pursuits. What goals would you like to achieve this year? Choose ONE word from the pile that resonates the most or would be the strongest catalyst for accomplishing most. Create a bulletin board or use the fridge door. Have an area for each family member. Write your ONE WORD creatively and put it in view. Add pictures or any illustrations of what developing that trait will help you accomplish. This becomes your goal board. You can go a step further: Keep a small notebook on your early morning workspace. Write your ONE WORD and what it will help you accomplish specifically each particular day. At the end of the day, write the positives of the day: small accomplishments to big things you appreciated. This is a great practice that keeps your head in a positive, productive space. What’s your ONE WORD? Reply and let us know! The original idea for One Word came from http://www.myoneword.org. This entry was posted in Maximizing Potential, maximizing your child's potential, sports, sports parenting and tagged 2014, accomplishment, champion, focus, goal board, goal setting, goals, less is more, my one word, narrow the focus, new year's resolutions, Olympics, one word, today show. Bookmark the permalink. Great way to gain positive focus for the year ahead…. I will be picking my word today. I’m still considering my word as well. Take your time and find the one that seems to energize you. Enjoy the process then have fun finding creative ways to keep your word in front of you! EXPLORE. I want to explore new opportunities, explore a new year ahead for new experiences, explore what my potential could be… This includes not being timid in discovering but active in pushing into new territory, new places, people, pursuits. EXPLORE is exciting. Perseverance…… need to finish nursing school, while simultaneously homeschooling. You are being a GREAT model to your kids! You’re maximizing YOUR potential by having personal goals while continuing to invest and engage in their lives by homeschooling them. Super mom award, Denise. AWARENESS: That’s really where it all starts isn’t it? Awareness of others’ desires FOR us that do not necessarily jibe with our own; awareness of our own internal drive; awareness of inspiration over motivation; awareness that each and every one of us IS a champion at being capable of great things; awareness of what our truest passions say to us… Yup…I could write aan entire feature on this. Hmmmm….maybe I will..awareness. I think sometimes we run our lives soooo fast, we lose….awareness. It takes a little bit of quiet and time to be still to simply muse and listen to our own gut. BUT I’ve found it’s essential… feature…maybe….series of articles… yes! Go Swim Great site with technique videos, swim practice sets and drills.